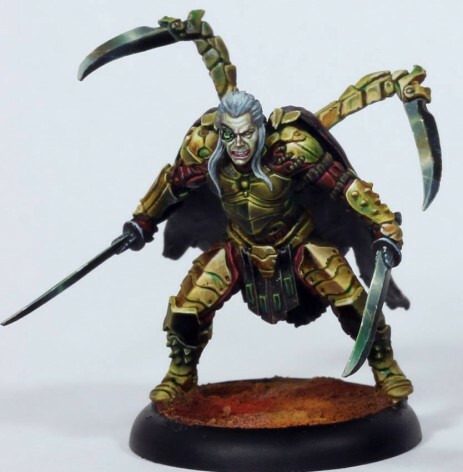 I’m back again to talk about the latest Forsaken Saint for Dark Age: Johann! I’ll admit I’ve been looking forward to the release of Johann – and the perfect window it gives me to write this article. Johann is easily the most interesting of the Forsaken Saints. He’s certainly the most unique. After all… he’s the evil Saint. He’s also the eldest Saint. When Mark, John, Mary, and Luke were out pacifying lawless corners of the Forsaken realm, Johann already ruled over a peaceful, prosperous region to the northeast. Any bandits that troubled Johann’s little kingdom were executed outright or swelled the ranks of his enforcers. Perhaps Johann’s iron will was enough to keep his subjects obedient. Perhaps… but it’s not hard to figure out what other advantages he had working in his favor. Johann never took an interest in the central Forsaken government until it looked like they might ban grafting. One of the more advanced technologies to be recovered from the age before humanity’s fall, grafting is the science of enhancing humans with cybernetic or even non-human organic parts. It was now under moral assault as a heretical affront to god’s own image – the human form. Johann traveled to Port City. His passionate oratory before the Forsaken ruling body seemed to do little. It seemed certain that grafting would soon be relegated to animal use only. When Mark and John were declared Saints, Johann was quick to canonize himself, seeing it as a means lend more gravity to his pro-grafting philosophy. It was not to be. The wave of religious fervor continued to sweep over the Forsaken, culminating in the inauguration of the Prevailer council. They not only outlawed human grafting, but failed to even consider Johann for a position in their new government. Johann responded by fortifying a massive structure abandoned since the fall. Here he invited all those grafters alienated by the council’s new decree. The locals began to disappear; subjects for Johann’s experiments. A conflict with the Prevailers was inevitable. Johann and a host of grafted abominations met the Forsaken army on the field of battle. Johann seemed to be gaining the upper hand, until John’s forces arrived to turn the tide. Johann fled with whatever followers could make it. Wandering through the desert, turned away by all his former allies, Johann’s next decision was based on desperation. There was one power left in the wasteland that might take in one of the Forsaken’s enemies. Johann went North seeking the Skarrd. The tribe of savages sent forth a champion to test the newcomer. Johann slew him so quickly that the Skarrd who witnessed the combat are still unable to agree on exactly what happened. Having established his position, the Saint has shared the secrets of grafting with his new allies. 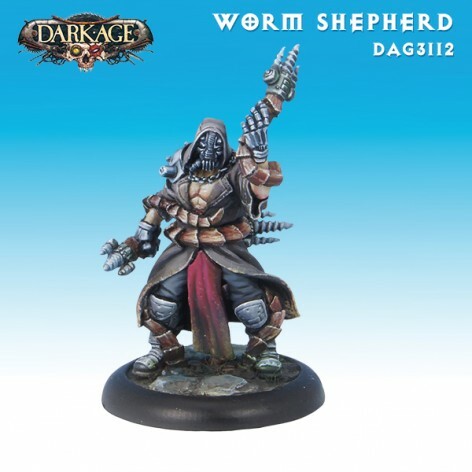 So if all that background makes Johann sound like an interesting character to base a Dark Age army around, here’s a link to his rules and those of his followers. His stats are pretty similar to the rest of the saints, with the noteworthy exception of his fourth wound. This is a pretty significant advantage, perhaps to compensate for Johann’s complete lack of ranged attacks. While this Saint will never shoot anything, he’s definitely a beast in melee. His Dual Katanas are a nice reliable way to spit out a couple of attacks. You can even cross your fingers and hope for the critical strike 2 with the added decapitation. His backblades are more of a sure thing with the added PW and rend – but they have a decent chance of MAL, so use at your own risk. Speaking of use at your own risk, lets talk Volatile Enhancement. This is one that’s best used sparingly for obvious reasons. When the time comes, get creative. I mean yeah, you can spend that extra AP trying to kill some important enemy model, but don’t forget Dark Age is a game of objectives. If you’re going to wound your own pieces, maybe spend that AP on trying to secure one. Quietus is Johann’s greatest former rival. When this warlord was finally subdued Johann subjected him to experimental grafting procedures which further enhanced his combat abilities. Rules-wise its easy to see him as a mini Johann. They share a weapon and are both pretty nimble. 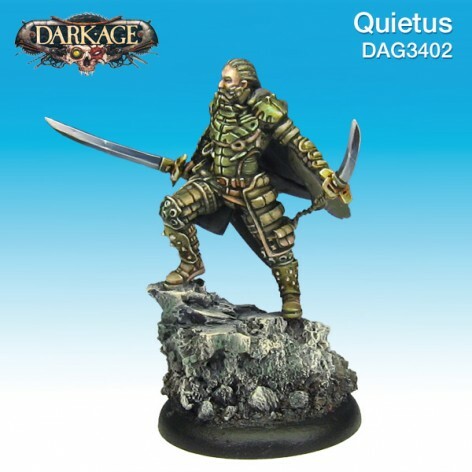 While Quietus has one fewer AP, he can actually be even more successful at killing mobs of infantry since he can give his Katanas the arc ability. It will cost him a wound to do this, but he can heal it back quickly with Fueled by Combat. He also hits harder than he appears with the Victimize/Sadistic combo. The downside is he’s pretty expensive, and cannot Squadlink. Haborya is one of Johann’s most loyal warriors. A near fatal accident put her under a grafter’s scalpel. She’s now the only Harpy with her mind still intact. She’s one of three models whose inclusion will allow you to field models from the Skarrd faction: Harpies if you couldn’t figure it out. The fact that she grants them hit and run is pretty amazing as there’s no limit on how many times they can use it. Combined with the Harpy’s above average movement, Harborya and a link of 3 Harpies could kill a lot of models if your dice like you enough. Unfortunately Harpies have pretty miserable stats, so don’t expect them to go on killing sprees too often. Their real strength is in Ambush/Gliding deployment which will let you put them down right next to the most crucial objective. Here’s a link to she Skarrd cards so you can get a look at those harpies. Dominique is one of only two Johann models based off a Brom painting which kinda explains her… distinctive appearance. Like Harborya, Dominique gives a Johann force access to certain Skarrd models: Buzzblades in her case. These guys are to Skarrd what Flock and Militia are to Forsaken: dirt cheap bodies. 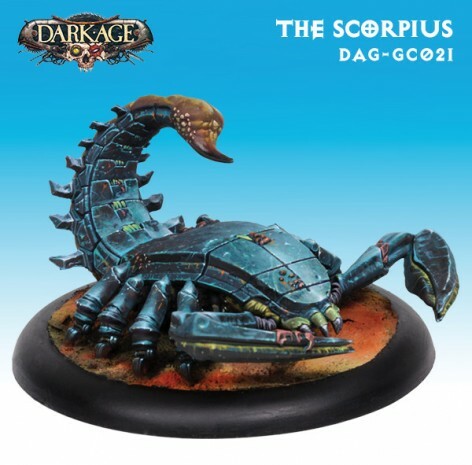 Dominique can Squadlink with them making them pretty good given how cheap they are. She makes them alright in combat – accurate but still weak unfortunately. With their innate Cannibal ability and the Victimize ability she gives them, they also become decent debuffers. Dominique functions similarly, not being particularly hard hitting but debuffing enemy models. Only she hands out not only Panic counters but Whiplash counters as well. 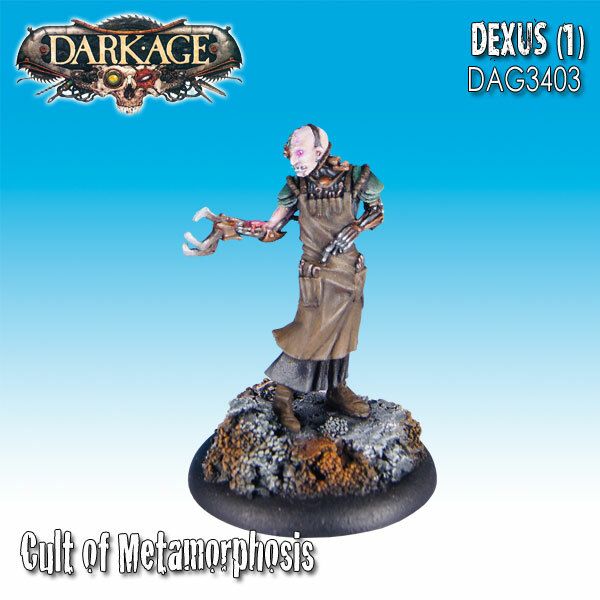 Dexus is perhaps the greatest living grafter and the creator of Johann’s own enhancements. He’s also possibly even more evil. His Stim Injection ability is pretty powerful and will often be worth using given how important a little extra movement can be in this game. He’s also great to have around for Superior Maintenance: something you can never get enough of. His Volatile Enhancement, like Johann’s, is best used sparingly. The Worm Shepherd is one of my favorite things about the Scorpion Saint. I think the model is great but most importantly he lets you take Drillheads. Drillheads hit hard, have an Assault Group with Extreme Damage and Pierce, and even have three wounds. All for the low cost of just 85 points. The shepherd himself is easily just as good in melee. He doesn’t hit as hard but can make more attacks. Additionally he makes the worms better. The re-roll he gives them is quite useful but Guard is where it really counts. The Drillheads are beefy models who can afford to take a couple of hits for more important key pieces. I think this crazy Scorpion might be what ends up drawing the most people to play Johann. It looks cool as hell and is a really mean model in game. I’m still kind of overwhelmed by how good it seems. With 6 wounds, ARM 20, and Regeneration, it’s going to be insanely hard to kill. With Ambush, you can put it anywhere you want, and you don’t have to worry about it getting shot at on its way up the table. It hits incredibly hard and all of its attacks have Toxic. Anything it doesn’t manage to kill will have a harder time striking back. It can even make an attack that causes paralysis although there’s only one attack in that Assault Group. It’s one downside is that it lacks a ranged attack, and can make fewer attacks per AP than similarly beefy models. Its fourth AP, along with all the other aforementioned abilities more than make up for this. For my first Johann list, I know I want to field Johann and the Scorpius. In a 500 point game Dominique and 3 Buzzblades are a characterful way to fill in the rest of your points. Although you might do better taking a couple of Strikes or Ravages since they can survive a one-time use of Volatile Enhancement. I prefer the Strikes myself. I’m going to follow that line of thinking for my 750 point Johann list. I’m going to add another Strike, Dexus, a Field Medic, and a couple of Militia. I prefer the Medic to the Forsaken’s other healer, the Sister of Compassion, for one reason. The Medic has Commander 1, meaning she can join the Squadlink with Johann, Dexus, and the Strikes. This means she can keep up with them, and they won’t find themselves out of range of her Medic ability. 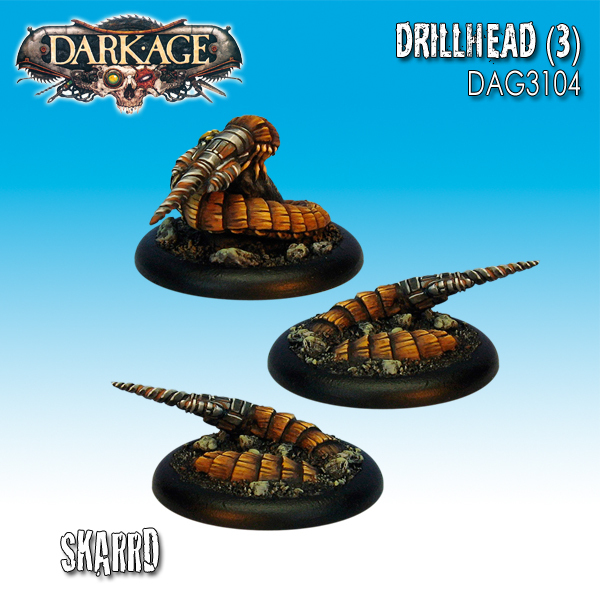 Of course I also love Drillheads… If you do too you can drop the Scorpius and the Strikes to add four of these lil’ cuties and of course the Worm Shepherd who is a prerequisite to fielding them at all. Unfortunately the Drillheads are in kind of a weird place right now. 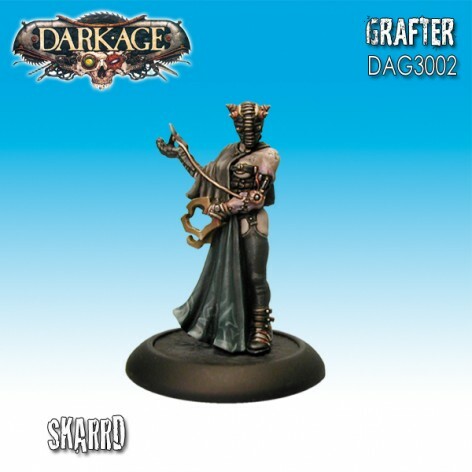 Most of the models in Dark Age have begun to be tweaked lately to put all of their points values in increments of 25. The Drillheads, along with the rest of the Skarrd, have yet to receive this treatment. Their cost of 85 points means they can be tough to fit in to a Forsaken list. In fact if you run the list I just mentioned you’ll be missing out on 20 points. That’s why I’m trying another list first. Hopefully by the time I’ve finished painting that one up, the Skarrd’s point cost will make list building with them a bit easier. ~Hope you enjoyed the article! What do you guys think of Johann? How would you run a Johann force?